going to get one of my 3310's ready this fall to play with. gonna stay with the sec. plate cause i have about a half dozen of them in my hand. all these plates have 34r9716b on them with a 21 stamped on them. what are the odds that after about 20 years of messing with these they are all the same. is there a better way to find the idle and main holes other than using my numbered drill set? ran a 3310 back in the 90's and had very good luck with it. thought i read somewhere that they had more numbers on these plates that would show the specs. would like to jet a couple up a tad just to play with and see what happens. running an edle. q-jet now and it performs great but would like to compare it to my holleys. going on a 350ci 375hp sbc with hyd. roller and vortec heads. Hi Denny & all; So maybe we all can help ya before you have a problem this time?? Holley's are one of my favorite engine parts. And I've got good enough fiddelin' with them to get into trouble & out. So where th heck are you located? Back in 69 I went to a Holley clinic as they held them around the country. That gave me enough info to be dangerous. And over the years I've had many friend ask for help. Since I don't have a chassis dyno, a 3 or 5 gas analyzer I have to rely on history & records I've kept. First off a 750 CFM is on the large side for 350 ci, but you already know that. 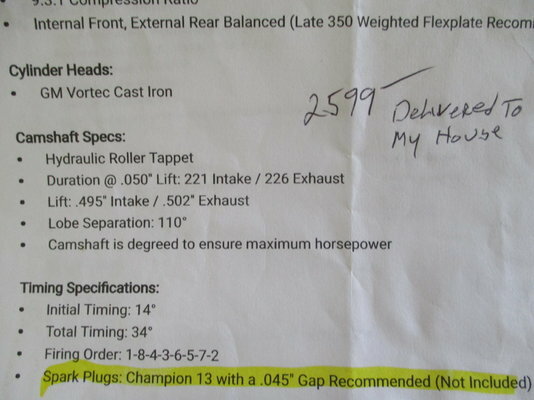 So tell us what the RPM range & cam specs are for this 375- 350. That will get us started. Then you will get many opinions & you can choose the ones you like best. I should mention I use base lines from Bill Jenkins & GM's Holley equipped engines of the past & a bunch of newer info from Quick Fuel. Rarely what Holley puts in their over the counter- after market carbs works well. They tend to be TOO RICH out of the box. Good Luck Ole' Bob. Hi Denny & all; So maybe we all can help ya before you have a problem this time?? Holley's are one of my favorite engine parts. And I've got good enough fiddelin' with them to get into trouble & out. So where th heck are you located? Back in 69 I went to a Holley clinic as they held them around the country. That gave me enough info to be dangerous. And over the years I've had many friend ask for help. Since I don't have a chassis dyno, a 3 or 5 gas analyzer I have to rely on history & records I've kept. First off a 750 CFM is on the large side for 350 ci, but you already know that. So tell us what the RPM range & cam specs are for this 375- 350. That will get us started. Then you will get many opinions & you can choose the ones you like best. I should mention I use base lines from Bill Jenkins & GM's Holley equipped engines of the past 7 a bunch of newer info from Quick Fuel. Rarely what Holley puts in their over the counter- after market carbs works well. They tend to be TOO RICH out of the box. Good Luck Ole' Bob. so great to hear from you again VANRAH. yes, would like to avoid any problem like the last one. i'm in central ohio about 20 miles south of columbus. 80 percent of my cruse rpm is under 2700rpm. this crate motor is advertised as a 350ci 375hp and they supply a dyno sheet with it. mine came in at 382.81 hp at 5200 rpm and 418.6 torque at 4000 rpm. cam is a hyd. roller with dur. at .050 221 in and 226 exhaust. lift is .495 in and 502 ex. lobe sep. 110. looks like a torque cam because idle is not bad at all. vortec heads and i set timing locked in at 34. 9:3 comp. 373 open rear. turbo 350 built by me. am now running a edl.q-jet which performs great. this is the second season with this combo. (edl performer intake). i have run about every holley i can think of (80528) on my vette now and other hot rods and have had great success. most holley problems are ignition problems. i like tinkering with ign. and carb stuff and intakes although it gets a little pricey with intakes because of the vortec heads. been messing q-jets since the mid 80's and have learned alot. have a couple 3310's now and have converted some to sec. block and 4 corner idle. this one is very clean and would just like to keep the sec. plate.cause i have about 7or8 eight them to play with. had good luck with a 3310 on a bbc with a small cam. it ran a hair better with a double pumper as expected. hi pontiacgp. been running a wideban for a while. i have also been told by some very good mechanics and good racers to not put all your faith in a wideban. they more or less say thats the last thing you look at. i do watch it a lot when i'm running around the back roads. usually runs in the 13:-- to 12: area. Must be some older mechanics and racers that have never used wideband - why quess when it tells you exactly where your at. hi pontiacgp. don't remember the guys saying they were inaccurate just with so many on the market that they said to not go all in with their reading. these are straight line guys. i watch mine all the time and have on occasion adjusted my apt screw to see a change. hi lilbowtie. yes they are older but they use them as a tuning tool with their other gauges and compare everything after the smoke clears. i like mine. I agree that there are some on the market that are junk. The good ones are not that expensive and can pay you back with less time spent guessing, better performance and better gas mileage. The last quadrajet I rebuilt before installing an AEM a/f worked great but the a/f gauge told me it was running a little rich and it was a snap to get it exactly they way I wanted it.